I want to take this opportunity to wish you a happy birthday and thank you for raising such a wonderful (son or daughter). Have an awesome day. I am so blessed to have you as my Mother-In-Law. Happy Birthday. Have A Wonderful Day. Thank you for being such a wonderful mother-in-law. Hope you have a wonderful birthday. I am thankful to have a mother-in-law like you. You have always been there for us, and have touched our lives in so many wonderful ways. Hope you have a great birthday. You have proved that all the mother-in-law jokes out there are totally untrue. Happy birthday to the most amazing mom-in-law in the whole world. I thank God for you and pray that you have a long and prosperous life. Have a wonderful birthday. Happy Birthday To A Wonderful Mother-in-law. Thank you for accepting me into your family as though I had always been there and for loving me as one of your own. For my mother-in-law thank you for your kindness, love and generosity. I appreciate all you do for us and hope you have the best birthday ever! To the best mother-in-law anyone could hope for. I am very blessed to have you in my life. Have an awesome birthday and many more to come. Happy birthday to a wonderful mother-in-law. Hope you have a fantastic day filled with everything your heart desires. If the words in-law are removed from mother-in-law, all husbands and wives of this world would realize that life has blessed them with two amazing mothers, not one. Happy birthday. Dear mother-in-law, today I want to reveal a little secret to you. You are the mother-in-law that every daughter-in-law wishes she had. Happy birthday. I want my daughters to grow up to become like you, sophisticated, elegant, charming and caring. Happy birthday to my beautiful mother-in-law. You always put others first. Today put your feet up and relax! We will make this a very special day for you. May you always be happy and healthy. Happy birthday! Your birthday is full of loving thoughts and special wishes too. Because it means so much to have, a mom in law like you! I am blessed to have you as a Mother-in-law. Thank you for all the wonderful things you do for us. Hope you have an awesome birthday. I appreciate you- for always being kind and loving and for the many things you do for us as a family. Have a wonderful birthday. You always put others first, dear mother-in-law. So today put work off, put some music on, put your feet up and relax on your Birthday! May you always be happy and healthy. You are always fun to be with, always loving and caring. You will have a special place in my world and in my heart, dear mother-in-law. Wishing you health and happiness always! Raising children would have been a much harder task if I didn’t have a supportive and understanding mother-in-law like you who guided me at every stage in life after marriage. Happy birthday. 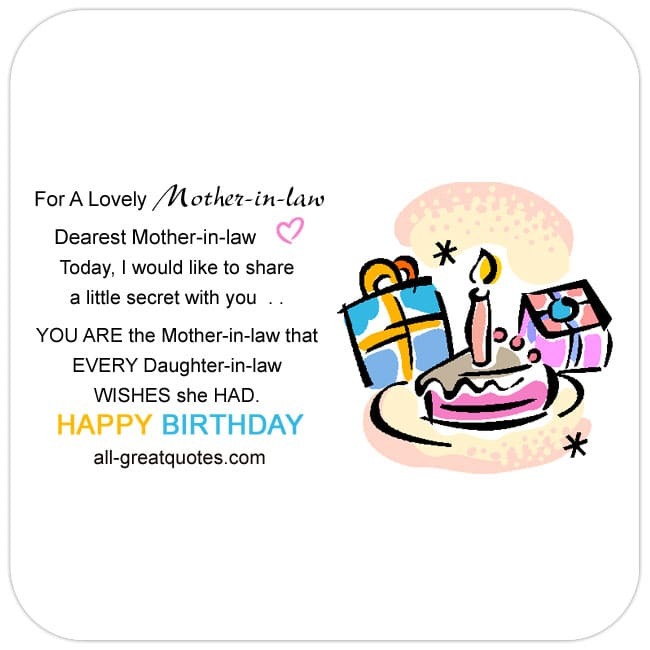 Happy Birthday To A Lovely Mother-in-law. If I didn’t have you as my Mother-in-law, I would choose you as a friend. You are such an extraordinary mother-in-law, so I can imagine how amazing you would be as a mother. Happy birthday to you. You are the best mother-in-law anybody can have. Happy birthday! Have an amazing day! If every woman had a terrific mother-in-law like you, every woman in this world would have a second mom. Happy birthday to the very best mother-in-law. My husband’s awesome personality and good behavior is proof that that he has had an excellent upbringing and a loving childhood, all thanks to a mother like you. Thanks for raising such a gentleman. Happy birthday. I want my daughters to grow up to become like you .. sophisticated, elegant, charming and caring. Happy birthday to my beautiful mother-in-law.